Church Publishing (New York, 2018). 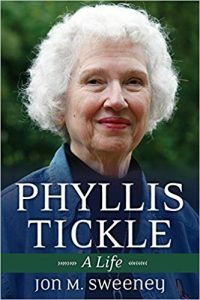 Phyllis Tickle, who died in 2015, was relatively unknown to many Catholics but was an important figure in recent Christianity in the United States. She was the founding religion editor at Publisher’s Weekly, but so much more. Sweeney was a close friend and her official biographer. Tickle’s personal life was full, as the mother of seven who experienced the pain of many miscarriages and the death of a son, from whose loss she never fully recovered. Her husband, a physician who struggled with his own sexual identity and dementia in his later years, was someone to whom she was always faithful. With her husband she struggled to find a church community that would be home for them. Much of her searching when it comes to the church may seem unfamiliar to Catholic ears. When she stepped back from church history she explained what she saw: “About every 500 years, the cultures within which Latinized Christianity has found a home go through a time of total upheaval in which everything — everything including religion, that is — undergoes redefinition and reconfiguration. We are in such a time now. 500 years ago in the 16th century we call our upheaval the Great Reformation. Tickle would then suggest that she saw a similar shift was at work today, one that she called Emergence Christianity or the emerging church, with far less focus on institutional concerns and more of a communal, informal and evangelical direction. As she attempted to try to understand church life around her, she was steadfastly a person of prayer. Ever since the early ’60s she had been faithful to saying the Divine Office five or six times a day, every three hours, starting with prime at 6 a.m. She did this, she said, to remember who God is and to forget about herself and to be in sync with Christians all over the world who did the same. Later she would publish three volumes of “The Divine Hours” for others to be able to join her in this practice. She said her prayer gave her a core that connected her with the Divine, and so she would slip away from a meeting or whatever was happening in her busy life to pray. As a poet, farmer, writer, publisher, editor, reviewer, essayist, journalist, wife and mother of seven, she was indeed hard to assess, although Sweeney tries to give his readers an intimate, detailed, admiring and at times perhaps overstated sense of her importance, one that we may not be able to fully gauge for a long while. Finley is the author of several books on practical spirituality, including “The Liturgy of Motherhood: Moments of Grace” and “Savoring God: Praying With All Our Senses,” and taught for many years in the religious studies department at Gonzaga University.